The bedroom is one of the power centers in a house, and careful positioning of the furniture allows positive chi to flow through the space. Map the bedroom, especially a master bedroom, with a bagua, apply basic feng shui principles, and honor your sense of what feels right and comfortable in the space. Start with the star attraction in the bedroom, the bed. How that bed fits in the room is so critical that the bagua map is of limited value until the bed is in place. Ideally, the headboard is placed against a solid wall, there is room on either side of the bed for easy access, and the bed is in the power or command spot: facing the door but not directly in line with it. Never situate the bed so the footboard is closest to and lined up with the bedroom door. This is the "death" or "coffin" position. A dead body is removed from a room feet first; it's very inauspicious to sleep in that configuration. Keep the bed away from the windows. Energy from the window that flows over the bed will disturb restful sleep. A headboard placed in front of windows is no longer in the powerful "command" position of greatest strength and security for the sleeper. Avoid locating the bed under an overhead beam whenever possible. That beam represents a threat to your health and wellbeing, and its strong line will "cut" your luck. Check all doors. They should open freely without touching or crowding the bed. Keep closet and bathroom doors closed when not in use. An open closet door interferes with the flow of energy and encourages stuck chi. An open bathroom door risks draining all your good fortune away, especially if the toilet is visible from the bed. 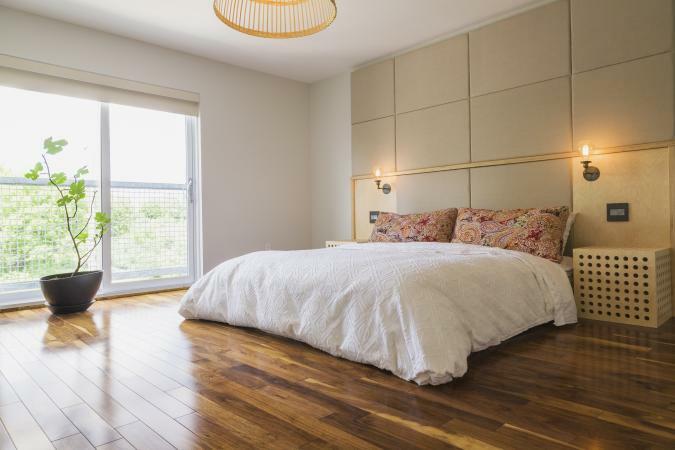 Once you've positioned the bed and made sure the doors open without obstruction, apply the feng shui bagua to the room to map its concentrated energy areas. This helps with placing the rest of the furniture. Align the lower border of the bagua with the main entry door of the room. Consider the most important goals or biggest issues in your life to decide what areas and types of energy to enhance. The far left corner from the main bedroom door is your Wealth area. A red lampshade on a nightstand or a red cushion on a rocking chair will boost wealth energy there. In the Relationship area, upper right on the bagua, a double bench or a painting of two of anything will magnify romance and relationship energy. A dresser or small bookshelf in the Family area amplifies family love and wellbeing when topped by a small dish of tumbled rose quartz hearts or a deep green jade bowl -- and no clutter. Not all bedrooms are blank canvases with adequate room for ideal furniture placement and no problem areas. Do your best and fix the rest with traditional feng shui remedies for common shortcomings. If the foot of the bed is aligned with the main door, place a tall bookshelf, an armoire, a decorative screen or a bench with beautiful pillows on it to interrupt the flow of chi out the door. A bed under a beam is protected with a fabric canopy over the bed. A simple line of prayer flags, delicate fairy lights, crossed bamboo flutes or a small crystal fastened to the beam can serve the same purpose. Shift a large armoire or dresser so its corners and angles don't point poison arrows (negative energy) toward the bed. Close substantial drapes across a window that's behind a headboard. If you open them during the day, a set of filmy sheers will slow the rush of chi in and out the window. 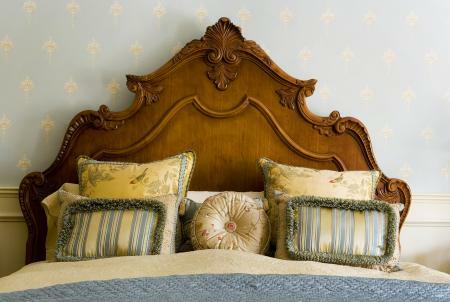 A tall, solid headboard helps to blunt the effect of a window behind the bed. Bedrooms serve two main purposes and neither of those involve binge-watching cable dramas or catching up with your social media. You can use a feng shui bagua as a helpful energy map to guide the arrangement of the room after the bed is optimally positioned. But color that map with what looks and feels beautiful and welcoming to you. Your life, your love, and your dreams are contained for a third of your time, every day, in just one room. Mapping your bedroom with energy-enhancing feng shui and your own personal style ensures that it will be time well spent.